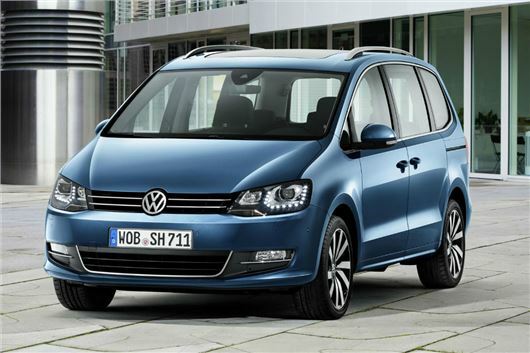 Volkswagen will premiere the revised Sharan to the public at the Geneva Motor Show. The updated model, which is cleaner and features more technology than before, will appear in the UK late in 2015 and is expected to cost from around £25,000. The updated model benefits from the latest Volkswagen Group safety equipment including post-collision braking, lane keep assistant and adaptive cruise control, plus parking assistance and blind spot monitoring. Under the bonnet, the engine range benefits from higher power outputs and improved economy. There are two petrol options with outputs of 150PS or 220PS, plus three diesels with 115PS, 150PS or 184PS. Additionally the DSG transmission has been revised to allow coasting, which improves economy. The touchscreen infotainment system has been improved and now features MirrorLink, meaning drivers can access various mobile phone apps directly via the touchscreen.